She confirmed her pregnancy four weeks ago and Halle Berry’s baby bump has been blossoming rapidly ever since. As she made her way through LAX airport in Los Angeles on Thursday, the actress’s bump appeared to have grown a good deal since she was last spotted in public. She has been favouring baggy maternity wear and once again attempted to conceal her changing figure, but was this time unable to do so. The 46-year-old’s recently discussed how shocked she was to discover she was pregnant: ‘I was at the doctor’s when they told me and I was completely shocked. And as she made her way through the airport her burgeoning belly peeked out from under her charcoal wool ruched jumper, which she wore over a white top. The Catwoman star also sported black leggings which clung to her slim legs, along with matching ankle boots. Halle wore a grey baker boy cap atop her crop of brunette hair, and also carried a black and brown fedora in one hand. She had just arrived in Los Angeles after a jaunt in Montreal, Canada. 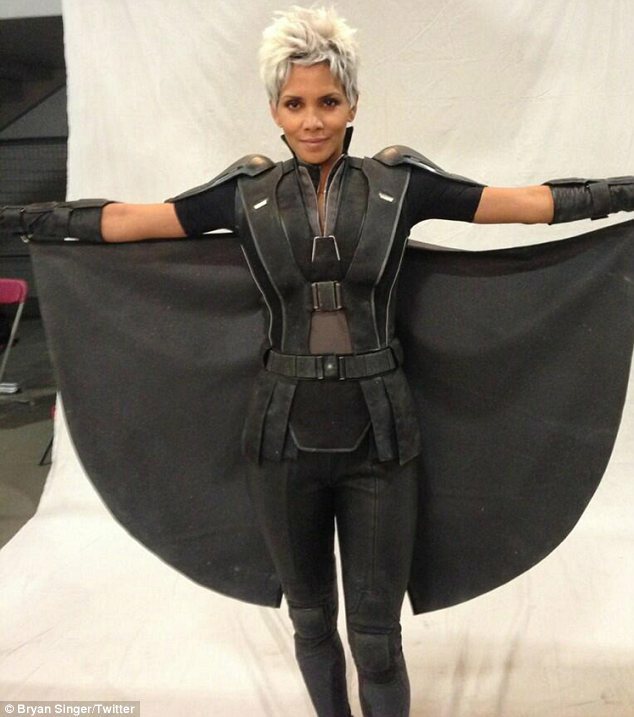 Halle was in Canada to start filming on the latest X Men movie, Days Of Future Past, in which she will be reprising the role of Storm. Last week the film’s director Bryan Singer tweeted a photo of Halle in full costume, and followed up with one on Tuesday which showed Hugh Jackman as Wolverine. No doubt Halle will be delighted to be reunited with her fiancé Olivier Martinez, and her daughter Nahla. While she was away Nahla, five, was left in the care of her father Gabriel Aubry.